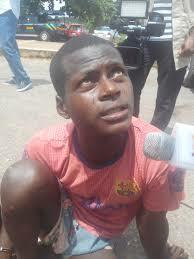 Taiwo Kadejo (26), a meat seller a purportedly assaulted an officer of Traffic Compliance and Enforcement Corps (TRACE) with cutlass on Thursday April 27 at Agbara in Ado-Odo Otta Local Governement Area of Ogun State has been arraigned and facing assault charge before Ota Magistrates Court in Ogun. The Chief Magistrate, Bar. A. I. Adelaja has given a verdict saying the accused should be remanded in Abeokuta Prison after the prosecutor, Cpl. Mustapha Abdulkareem confirmed that the accused truly the offence while the TRACE officer was discharging his lawful duty to the extent of inflicting injury on his head. His offence contravened Section 356(6) of the Criminal Code, Laws of Ogun, 2006, he stated. Taiwo has pleaded not guilty to the count charge and Bar. Adelaja has adjourned hearing till 5th July.